The black-and-white still of a boy's face. Carefree kids playing with a skipping rope on the sidewalk of a utopian suburbia (to the brash, brassy tune of a Perez Prado mambo). A pink-lettered title appearing across the fender of a pristine, pale blue Oldsmobile. 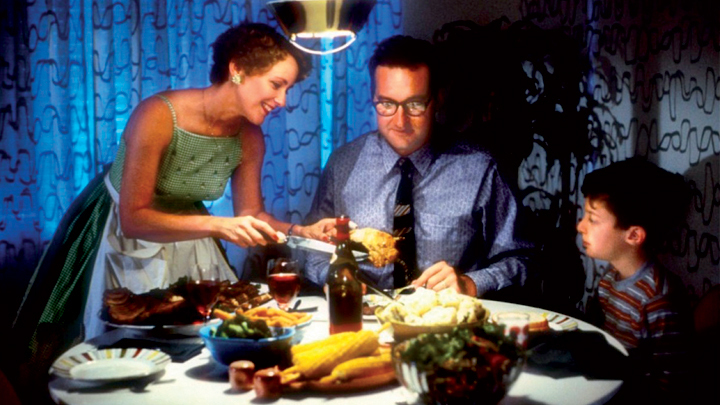 Bob Balaban's feature debut Parents (1989) opens with a montage devoted to pure nostalgia. The boy's monochrome image suggests a bygone childhood, the make of car conjures days of old(s), and even the title looks back to the previous generation. The 1950s were a time of (relative) comfort and innocence, coming after the turmoil of the Second World War but before the social upheavals of the Sixties. It is the decade regarded as most emblematic of American growth and prosperity, of heavily codified conservatism and family values - a sit-com cosmos where Dad goes out to win the bread, Mom stays home to make it, and Junior grows up to be just like daddy. Which is also to say that its iconography comes with a great deal of retrospective camp attached, and is ripe for parody and deconstruction - something which David Lynch showed all too well in the faux-Fifties world of his Blue Velvet (1986) and Twin Peaks (1990-1). Disembowel the 1950s, and you are challenging the American dream itself - or at least the version of it wherein white middle-class domesticity, conformity and patriarchy rule the roost. Balaban is playing a similar game with Parents. For Nick Laemle (Randy Quaid) and his wife Lily (Mary Beth Hurt), just moved in from out of town, are desperate to fit in and keep up appearances in their new suburban environment, and so perform their very own parody of the American dream, while their young, impressionable son Michael (newcomer Bryan Madorsky) - whose skewed, at times hallucinatory point-of-view is also the film's - sees everything around him as a bloody waking nightmare. There is, from the start, a strong focus on meat here, as we see Nick and Lily happily barbecuing together outside, serving up bountiful platters of chops, and even enjoying carnal midnight trysts before the open refrigerator. By contrast, vegetarian Michael is, as Lily tells the school's chain-smoking psychologist Millie Dew (Sandy Dennis), "not much of an eater" - and after a classic 'primal scene' in which he walks in on his parents late one night and imagines he has seen them hungrily devouring one another, the boy, already isolated and decidedly strange, grows ever more disturbed, and starts wondering about the provenance of all those fleshy "leftovers" on the table. What follows is a deeply ambiguous fusion of the family's reality and Michael's psychotic fantasy, where cracks in the surface sheen of 1950s home life expose something deeply poisonous and combustible beneath. Initially signalled by their monochrome presentation, soon Michael's deranged visions start coming in full colour (and daylight), with only the canted angles and deliriously spinning mobility of Ernest Day and Robin Vidgeon's camerawork - and the odd animated salami - to mark how off-kilter a view of bourgeois Americana this is. "It's too early to say what's wrong with Michael. I can't put my finger on anything specific. He's too slippery. He's bright. Ooh, he's rude. But he's very perceptive." Dew's assessment of Michael might as well serve as a description of the film in which he finds himself - a film that brims with bright, perceptive social commentary, rude dissections of upwardly-mobile etiquette, and slippery equivocations on its characters' motivations and mores. The question of whether the Laemle adults really are cannibals, or whether the psychosis is all in Michael's head (where, as Nick puts it, "there's a lot going on inside"), remains essentially unresolved - or at least is left for the viewer to decide. "What does your father do for a living? ", Michael is asked by his new and only schoolfriend, the similarly troubled Sheila Zellner (Juno Mills-Cockell), who alone seems able to see through the picture-perfect façade of Fifties decorum to the underlying malaise. Later she will say of her own mother, "Just because she washes her puffy little hands before dinner and puts her napkins on her knee and acts polite to you, you think everybody's parents are wonderful," before further firing Michael's already overactive imagination once again with the question, "How do you know what your father really does all day?" Yet even if Nick is not really, as Michael fancies, bringing his work home with him in the form of body-snatched human parts for the dinner plate, he is developing a chemical 'jungle' defoliant for a company named Toxico, and testing the damage that it will do to human organs. Those liver samples he gets from Toxico's "Division of Human Testing" may just be "leftovers", but we know, with the benefit of hindsight, that there are millions of Vietnamese and Cambodian "leftovers to be" just waiting to suffer the horrific consequences of Nick's Agent Orange-like dioxin in the decades to come. So Nick may not be quite the monster that Michael imagines him to be, but he is a monster nonetheless - and the future of madness and murder that he is helping to fashion is a legacy of lunacy, passed down to his son - who would have grown up by 1989, when Parents was made, to be an adult in his forties, and possibly a parent himself. The Oedipal conflict that Parents plays out is timeless, but also very much rooted in its times, with a darkly comic nostalgia that looks both backwards to a Paradise lost and forwards to one perhaps never regained. With his parents long dead, what Michael and his generation have become is our problem now.